Seminar Topic- Optical Computing which is also known as Photonic Computing. It is one of the emerging technology in the Computer Science field. This topic will help the students of CSE and IT branch to understand the concept and raise their interest to create the computers of tomorrow. What is an Optical Computer? An optical computer is a computer that performs its computation with photons as opposed to the more traditional electron-based computation. Photons, effectively massless and incredibly fast, are generated using diodes or lasers. The photons take the place of electrons in more traditional computers and are used to represent the flow of data. Lacking the size limitation of electrons, photon-based transistors can be incredibly small which increases potential computing power. The first seminar report on the topic Optical Computing explains the benefits and problems with optical computers. The seminar report elaborates the vital parts of a computer that can be replaced with their optical equivalents. The paper will discuss the feasibility to completely replace copper wires with optical fibers in motherboards, then explain how is computation with photons possible. 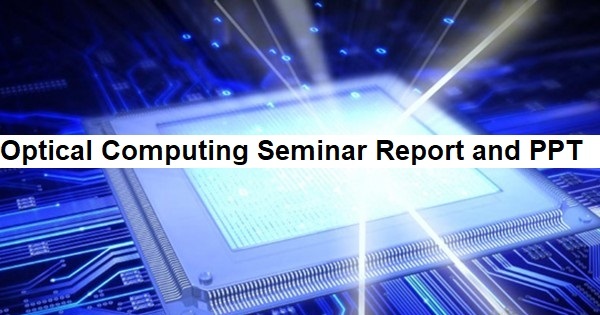 Another pdf seminar report explains the need for optical computing, Holographic Data Storage, Key Optical Components for Computing, major breakthroughs on optical computing. Then, it focuses on the Uses of Optics in Computing, Development of optical processors for asynchronous transfer mode. In the end, all optical storage and memory will be discussed. The PPT powerpoint presentation on Optical Computing briefly explains how they work and why we need them. It explains the basic path of information through an optical computer with diagrams. Further, we will learn the approaches of Electro-Optical Hybrid computers and pure optical computers, optical processors, optical transistors and optical logic gates. The PPT also explains the difference between Optical and Electrical Switches. Finally, the presentation interprets the advantages, limiting factors for optical computers and its future aspects.